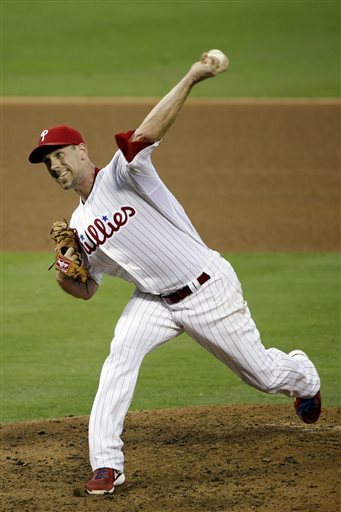 Cliff Lee was cruising right along. Through four scoreless innings, Lee had thrown only 40 pitches and looked in Cy Young form while his counterpart, Gio Gonzalez, was being worked into deep counts. And then the fifth inning happened. Back-to-back homers by Anthony Rendon and Wilson Ramos put the Nats ahead 2-0. That would be all the Nats needed as they cruised to a 5-1 victory, ending the Phillies three-game winning streak. If I would have told you before the game that Cliff Lee would exit the game with 64 of 76 pitches thrown for strikes after seven innings, what would you have guessed the result to be? How about if the opposing starter labored and threw 117 pitches through seven? Through four innings, Lee looked un-hittable. Lee made quick work of the Nats and was efficient with his balls and strikes. But a pair of back-to-back homers, Rendon and Ramos in the fifth and to Ryan Zimmerman and Jayson Werth in the sixth, put the Phils into a 4-0 hole. Darin Ruf‘s solo opposite field shot in the bottom of the seventh was the only Phillies’ run of the night. Luis Garcia made his Major League debut for the Phillies, pitching a scoreless eighth against the heart of the Nats line-up. Garcia got Bryce Harper to ground out, struck out Ryan Zimmerman on a wild pitch that landed in the dugout after bouncing in the dirt, and getting Adam LaRoche to ground into one of the best 4-6-3 double plays you will see all year. Garcia struggled slightly with command but showed a plus-slider and hit 97 MPH on the gun multiple times. The Phils look to win the series tomorrow as Kyle Kendrick takes the hill against Jordan Zimmerman.